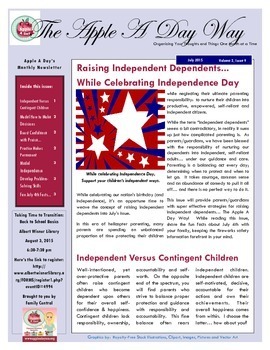 While celebrating our nation’s birthday (and independence), it’s an opportune time to weave the concept of raising independent dependents into July’s issue. In this era of helicopter parenting, many parents are spending an unbalanced proportion of time protecting their children while neglecting their ultimate parenting responsibility: to nurture their children into productive, empowered, self-reliant and independent citizens. While the term “independent dependents” seems a bit contradictory, in reality it sums up just how complicated parenting is. As parents/guardians, we have been blessed with the responsibility of nurturing our dependents into independent, self-reliant adults… under our guidance and care. Parenting is a balancing act every day; determining when to protect and when to let go. It takes courage, common sense and an abundance of comedy to pull it all off… and there is no perfect way to do it. 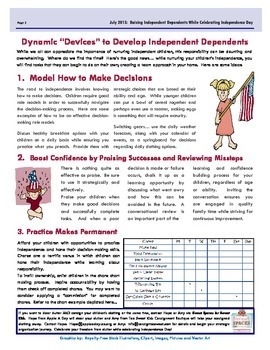 This issue will provide parents/guardians with super effective strategies for raising independent dependents… The Apple A Day Way! 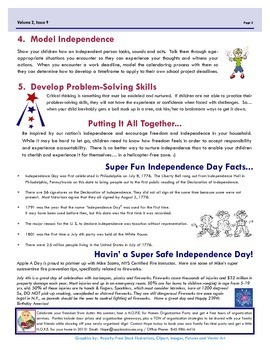 While reading this issue, share the fun facts about July 4th with your family, keeping the fireworks safety information forefront in your mind. 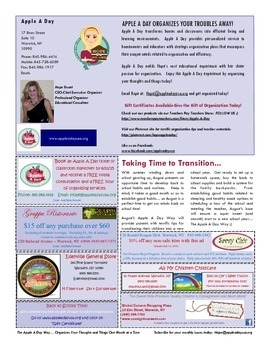 Become an Apple A Day follower on TPT and receive The Apple A Day Way in your inbox each month. Give yourself the gift of The Apple A Day Way... today!